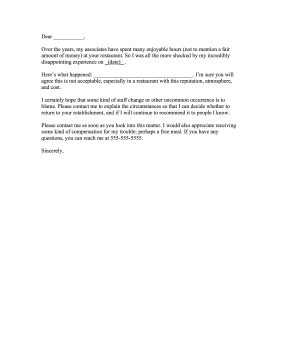 Bad service, food, or wait times can be filled into the blanks of this restaurant complaint letter. Over the years, my associates have spent many enjoyable hours (not to mention a fair amount of money) at your restaurant. So I was all the more shocked by my incredibly disappointing experience on _(date)_ . Here's what happened: ____________________________________. I'm sure you will agree this is not acceptable, especially in a restaurant with this reputation, atmosphere, and cost. I certainly hope that some kind of staff change or other uncommon occurrence is to blame. Please contact me to explain the circumstances so that I can decide whether to return to your establishment, and if I will continue to recommend it to people I know. Please contact me as soon as you look into this matter. I would also appreciate receiving some kind of compensation for my trouble; perhaps a free meal. If you have any questions, you can reach me at 555-555-5555.